In November, 1997, Thuy read a Newsweek article, ‘A quiet war over the past’, which related the heroism of Hugh Thompson and his helicopter crew when they rescued villagers in the midst of the massacre and who were ultimately responsible for stopping the massacre. The article mentioned ’60 Minutes’ was bringing Hugh Thompson and his gunner Larry Colburn back to My Lai to be re-united with villagers they had rescued thirty years before. With that meager bit of information Thuy began knocking on doors in Hanoi in an attempt to find anyone who knew more about this event. At one point he talked to Chuck Searcy, who at the time was the Vietnam project director for Vietnam Veteran’s of America Foundation. Chuck asked him if he knew me and went on to tell Thuy about the humanitarian programs I was facilitating in My Lai on behalf of the Madison Quakers. By this time, mid-February, 1998, I was back in Hanoi. Thuy invited both Phan Van Do, project coordinator for the Madison Quakers projects in Vietnam, and me, for supper at his house. His film crew was there and there were many intense, emotional conversations during the evening. Mr. Son, for example, the sound-man, told me of working and fighting on the Ho Chi Minh trail for more than ten years and being sprayed with Agent Orange many times. Then the war ended and it was time for Son and his wife to try to start a family. Both of them were frightened because they had seen what happened to their friends who had been sprayed with Agent Orange; children born with horrible defects and ridden with cancer. Despite this they decided to have children and all their children are healthy. Son cannot explain this and now feels a kind of survivors’ guilt. Threading through these conversations were questions by Thuy. Did I take part in the massacre? Why am I doing humanitarian work in My Lai? What did I do during the war? And so on. He talked about being frustrated with the documentary he was to produce for the 30th anniversary of the massacre at My Lai. He felt he had no direction to take the film. Finally, late in the evening, I happened to mention I had played my violin at the My Lai Memorial in 1992 as an offering to the spirits of the dead. His eyes lit up and he asked me “If I find a violin for you could you play it?” I said I already had my violin with me in Hanoi. He jumped up and hugged me and kissed me and shouted something in Vietnamese which I learned later was “The film is finished”. He had found his direction for the film, “The Sound of the Violin in My Lai”. “The Sound of the Violin in My Lai” was released in Hanoi in early 1999. It was well received by both Vietnamese and Americans who attended the premier showing of the film. Since then the film has received a number of awards including the Best Short Film award in 2000 at the prestigious Asia Pacific Film Festival. 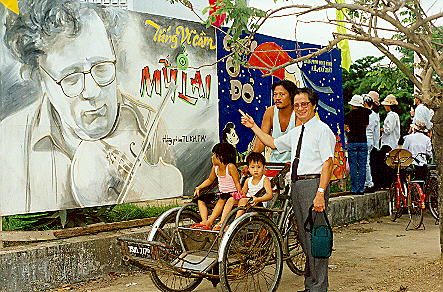 Tran Van Thuy points to the billboard promoting the Sound of the Violin in My Lai for the film festival held in Hue, Viet Nam where the film won the Silver Lotus Award. Silver Lotus Prize, 199 ?? "On the water of the Tra Khuc River, the sound of his [Mike's] violin rises as a prayer for the war, for those who fell down in muffled pain 30 years ago. Unlike the toll of Hemingway's bell, his violin is also for the people of today, to give them more strength to do the right thing: to forgive and to know how to deal with sufferings." "This is a film that both Vietnamese and Americans can watch with emotion but without being divided, and it is therefore a film that can unite us in looking forward to a future where such things are never repeated." From a Vietnamese man who attended the premier screening of the film. "At least this is a documentary in which there is a dialogue between the two sides ≠ Viet Nam and America. This is very different from the other [Vietnamese] documentaries, which are a monologue of our voice, our will, and our thoughts, and none of the Americans' about the war, even though both sides were involved in a war which caused pain for both countries." Phan Lac Nhi, journalist, in an interview with Tran Van Thuy. "The sound of the violin lingers on the mutual grave of the victims in the past, and is more meaningful than any other message in words: that the past cannot be forgotten, but the present needs to lean forward towards friendship and forgiveness." Do Ha Thanh, in a review of the film. "This [film] is not to reopen wounds but to reopen minds. This film will serve the cause of mankind for many generations."